Sometimes, it’s hard to explain why something goes viral. There are lots of cute baby videos on YouTube, for example. Somehow, Charlie bit my finger – again! went viral (866.8 million views and counting since 2007), while others didn’t. Twitter user hodlonaut started the trust chain by saying he would pass on 100,000 satoshis (the smallest unit of bitcoin) to the first person he trusts. And that person should pass the payment – along with an additional 10,000 satoshis – to another trusted user (and so on and so forth). But the trust chain has gone much further than anticipated. 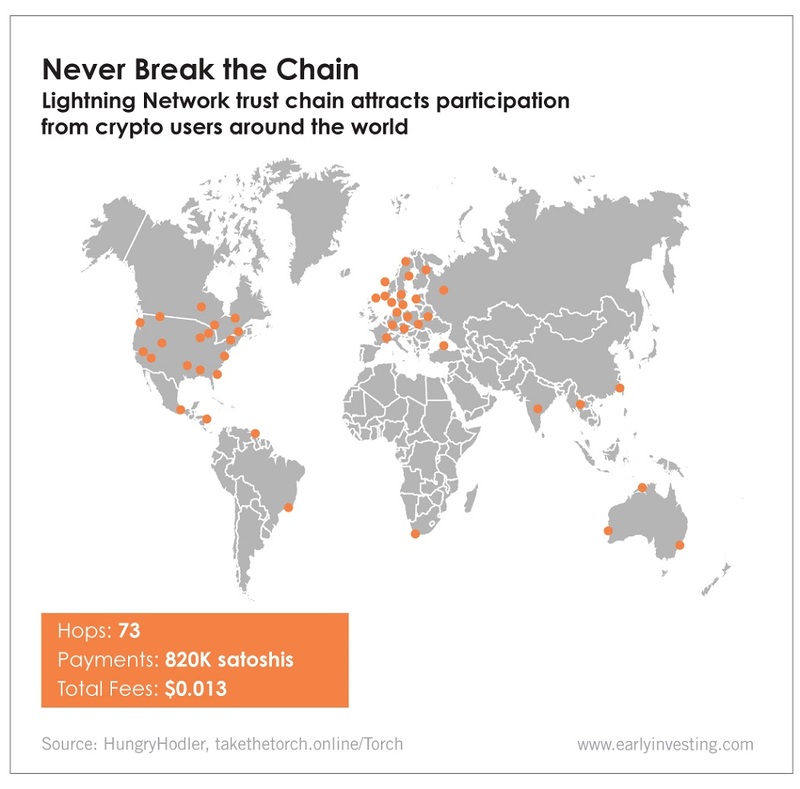 Last Tuesday, 139 people in at least 37 countries were participating, and payment had reached around 820,000 satoshis. As of today, 176 participants turned the chain into 2.96 million satoshis (around $107). What hodlonaut didn’t count on was the passion of the bitcoin community and just how much they wanted to participate in something that demonstrated the growth of bitcoin. Dorsey responded by posting the requested invoice. When Odell sent the funds, Dorsey passed the torch to Lightning Labs co-founder Elizabeth Stark. This isn’t the first time Dorsey has publicly supported bitcoin. He has repeatedly praised the crypto on Twitter, saying bitcoin is the only crypto he owns. “Bitcoin is resilient. Bitcoin is principled. Bitcoin is native to internet deals. And it’s a great brand,” he tweeted. Adam Sharp has been saying the same thing for years. Bitcoin’s strong brand and dedicated community are just two reasons why it’s so successful. And the trust chain is a testament to that community. The #LNTrustChain showed the world: 1. Lightning works and it’s amazing. All of us who’ve used it in a solo context (buying stickers, playing games, etc.) already knew it, but this experiment was the first widespread public demonstration of its power. And feeling comfortable with it speaks to the overall character of this group of enthusiasts. Random people will step up to contribute to projects like this and help move things along where they can. Really glad to have been a part of this! This demonstration has been a big moment for crypto. The crypto community really wants bitcoin to work – and to work well. And this experiment has been working. That’s inspired more people to participate and take notice. 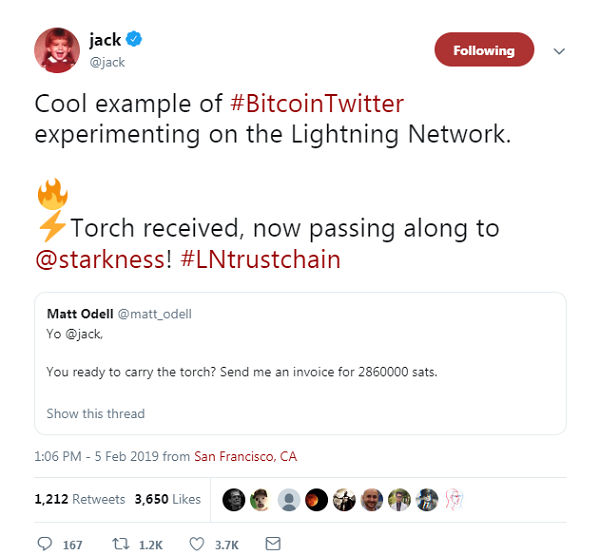 Yes, this is just a small sample of the Lightning Network’s potential. But the energy and excitement surrounding it is undeniable. Just imagine what the excitement – and usage – will be like when the technology has been perfected. 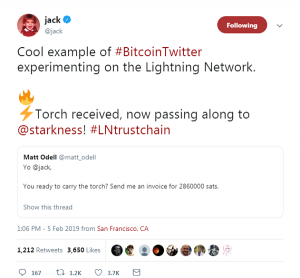 The post Lightning Network’s Trust Chain Goes Viral appeared first on Early Investing.